A beautiful specimen of one of my favorite animals sings one of my favorite songs under my favorite lighting conditions in Rocky Mountain National Park. I was recently privileged to spend a week chasing Rocky Mountain elk around Colorado with a big lens. For this trip, I based in a small rental cottage just west of Estes Park, CO. Each morning before daylight, I drove the short distance Moraine Park on the east side of RMNP. Upon arrival at the park's huge meadow, I pulled over, turned off the SUV and listened for the awesome sound of elk bugling. With the large number of these animals located in and around the huge Moraine Park meadow, locating a bull was not often a problem. However, it didn't take long to figure out that multiple bulls bugling in close proximity made for the best action during this peak rutting period. Upon locating a number of bulls (and when the 7:00 AM park service meadow curfew lifted), I began to approach the targeted animals from the direction the sun was going to rise. While the majority of the other photographers simply photographed from along the road, I found that hiking into the meadow, often 1/2 mile or more, produced a higher number of images I liked. Reasons for the better images including the ability to approach at a better light angle, better alignment of the background and the option to get a better height with an eye-level camera position generally being preferred. First, the sun had just crested the mountain behind me, meaning that this was the warmest-colored light the meadow would see. That light was from directly behind me, meant that shadows were minimized and the low sun angle easily created a strong catchlight in the elk's eye, adding some life to the subject. With clouds shading the background, the sun-lit subject becomes even more eye-catching. That I can almost hear the body position is yet another reason. 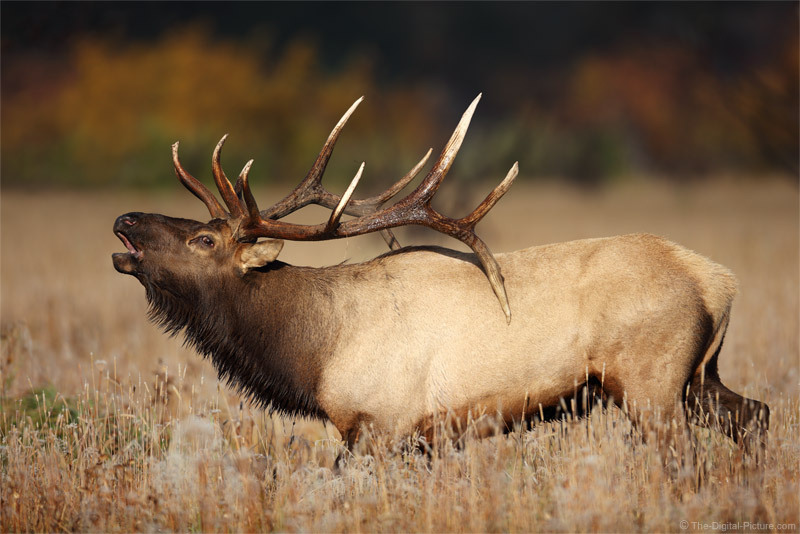 With the large, symmetrical antlers laid back and the mouth wide open, this elk is obviously bugling. The side-on body position with the head turned just slightly toward the camera usually works ideally. Some frost and golden grasses surrounding the elk with some fall colors in the strongly-blurred background round out the reasons this image became one of my favorites.